Ask anyone what they associate with the month of October and you may get lots of different answers. As we head towards the end of the year, shortening days and longer nights call for sweaters and boots, football games and hay rides. Falling leaves and their associated orange and red hues would also be a popular answer but quite possibly one of the top would have to be anything and everything pumpkin! Whether it be the perennially popular pumpkin spice latte at your favorite coffee emporium or the most basic of Jack O’ Lanterns gracing the neighborhood porches in anticipation of that holiday celebrated by children (and adults) on the 31st, all things pumpkin are to be celebrated in October. This pumpkin bread recipe combines spicy notes of cinnamon, cloves, ginger and nutmeg with creamy-orangey goodness for a delectable bread you’ll love to bake and with the availability of canned pumpkin, enjoy year around! A sweet, dense loaf with a ribbon of cream cheese flavored with citrus in the center of each slice. Preheat oven to 325 degrees. Grease two 8x4x3 inch loaf pans and set aside. 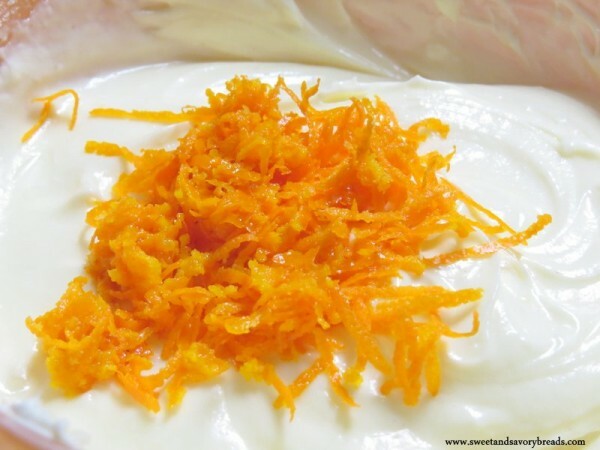 In a medium bowl beat softened cream cheese; add 1/2 cup sugar, 1 tablespoon flour, 1 egg and the grated orange peel and continue beating until smooth. Set bowl aside. In a separate bowl thoroughly combine the flour, baking soda, salt and spices. Set this bowl aside. 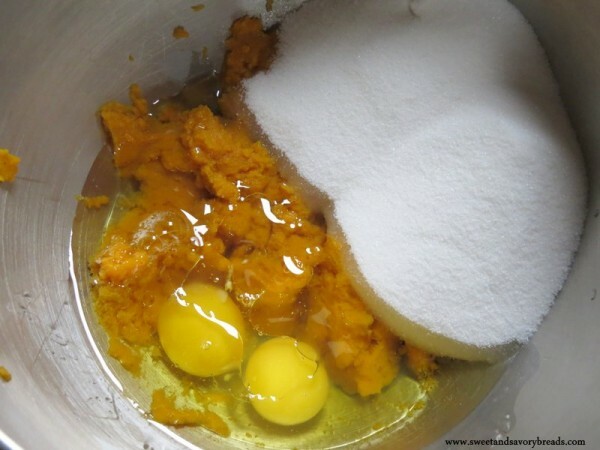 In a large mixing bowl put pumpkin puree, vegetable oil, two eggs and 1 1/2 cups sugar and beat well. 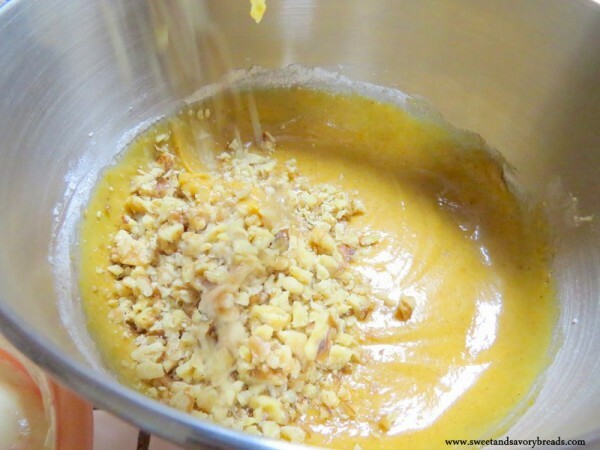 Stir the flour and spice mixture into the pumpkin mixture until just combined. Fold in the chopped nuts, if using. 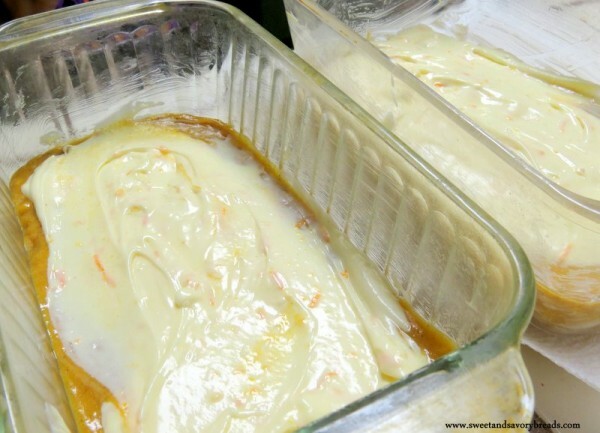 Divide 1/2 of the pumpkin batter into the bottom of the two prepared loaf pans spreading evenly. Spoon 1/2 of the cream cheese mixture into each pan and spread towards edges and corners. Divide half of remaining batter evenly into each pan and spread, covering the cream cheese mixture as best as you can. Bake in a pre-heated 325 degree oven for 60-70 minutes or until a toothpick inserted into the center of each loaf comes out clean. Cool loaves in their pans for 10 minutes. Loosen edges with a knife then carefully remove to wire racks to cool completely. Wrap well and store in the refrigerator if not eaten immediately. Expect a dense loaf and because it contains cream cheese I recommend storing leftovers tightly wrapped in the refrigerator. This bread tastes even better the next day after all the flavors meld. Enjoy for breakfast or a snack with your favorite coffee, tea or milk. 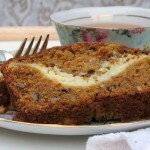 This pumpkin bread recipe makes two loaves, one for you and one to share! Posted in Quickbreads, Sweet Loaves for GiftingTagged bread, cinnamon, cream cheese, featured, orange, pecans, pumpkin, sweet, walnutsBookmark the permalink.